SECSI » Precipitation with 16 digits of precision, really? Precipitation with 16 digits of precision, really? We are proud to have wetter.com in Konstanz. According to Stiftung Warentest, an independent organisation for testing of goods and services for consumers, wetter.com has the best weather forecast. „Best in terms of temperature and precipitation“ probably means how accurate the prediction is. If I want to go out, I want to know if it is going to rain or not. If it is going to rain, I want to know if it going to rain a little or a lot. 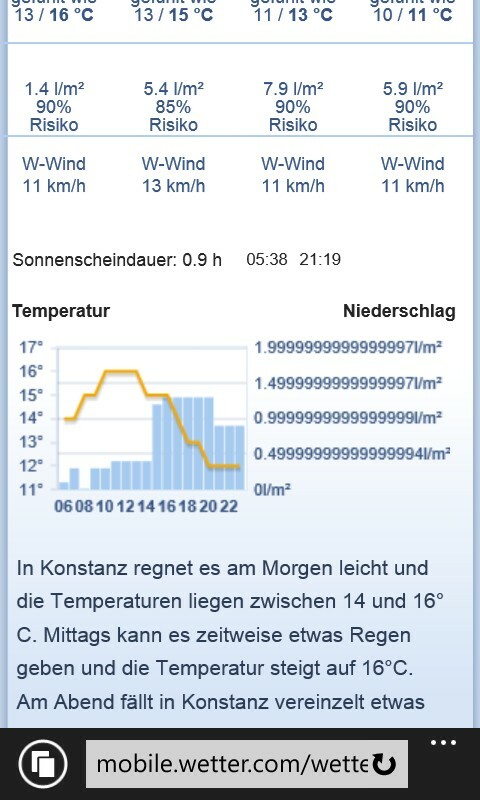 Wetter.com is also very precise. I was about to visit one of our student interns at the company and checked the wetter.com website in advance. I usually use yr.no which also offers a good forecast and has zero advertisements. The forecast I got had the precision estimate with 16 digits of precision. Wow.